AC Splits - What would Dennis Do? These days we see more DC indoor fan motors , the more economical and basic units use a phase control motor. These are a split phase motor that provide variable speed control using variable voltage and speed tach reference signals. The motor is powered via an SCR or silicon controlled rectifier which will increase or decrease voltages to the motor. The fan also has a "hall effect" or position signal system that uses a 12vdc input from the pcb which gets chopped back per rpm. As the rotor turns, there may be two hall effect picks ups in the motor to send back to the pcb to detect the rpm. 2 - The motor capacitor is built on the indoor pcb, so you cant change it, If you have a fault , never exclude that from being a possible problem which is why you should change indoor pcbs on fan failures. 3 - High electromagnetic disturbance in rooms can cause these fans to go full speed and fail by inducing voltages into the tach system . Never install splits in high power/ high gain antenna rooms (you are not meant to anyway they are for people). If you turn on a unit and the fan goes at beserk speeds immediately , you have either a pcb or a hall effect malfunction including broken wiring or some induced voltages messing the speed referencing system. 4 - Do not expect to read 240vac in the fans primary power supply. The reason they can change motor speed by voltages is that the fan does not have sufficient ballast weight to cause a rotor lock and high current as in a compressor or drive motor. So if you expect to see full voltage and get less , do not always declare that motor is faulty. PS , most motor are thermally protected with embedded inherent heat cut outs. Ok... So scrolls are directional, in the wrong rotational direction , noisy and self destructing. Now if you are in the process of installing or changing compressors, contactor's or wiring repairs please note the following. Practically all these that use directional compressor systems have phase rotation detection circuits. They analyse this from two phases. Most will generate an error and fail to start if they are wired against the directional needs. This only applies to three phase systems , not single phase. The way to fix it , is to swap any two phases from the incoming supply at the incoming supply terminal connections. Never do this from the compressor or the contactor as the phase rotation circuits usually only reference the incoming supply at the mains terminals. If you change it elsewhere , you risk the system accepting it if the inlet supply is phased right , but the wiring is wrong at other connection points and the compressor will be allowed to run backwards!! 1 - keep all phase colour and orientation wiring the same throughout the supply ,switching as per the wiring diagram and compressor connections (U,V,W). 2 - If an error is generated , only change the incoming (mains) power supply connections. 3 - check with the manufacturer for accuracy. I cannot stress that enough. Scroll compressors for instance are shaft weighted and balanced for directional orbiting. Too expensive to get this wrong. Of course no one gets into electronics on pcb's but we see it all the time and never pay it attention. Now how do you prevent high voltage circuits from destroying low voltage circuits? 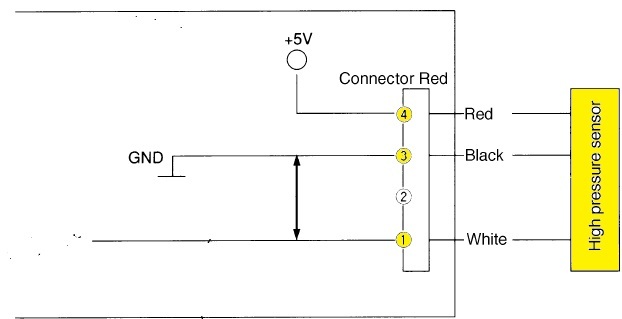 Basically a circuit that separates two voltages from each other by the use of a light sensitive relay gate. Imagine a relay closes everytime it sees a light rather than a voltage??. Cool hey, and lets face it how good would a light beam be as an insulator? Yes one part of the system, the low voltage, turns on a light emitting diode and closes a high voltage circuit , or it could be vice versa. This way you prevent low voltage control circuits from getting shorted to high voltage. And light is quite fast as you know 300 000 kms/sec, well faster than the relay gate closes. This can be used for a high voltage control safety to close a low voltage circuit on fault to generate a fault alarm and lock out a system. Now these are seen in safety control circuits and also in inverter gate switching to protect the pc from getting fried. In short , make sure your wiring and controls are not shorting out. Ok... never before have I implored anyone to read the specifications , in this case a piping layout for your system might just help you out one day. Blockages and restrictions in AC systems are probably one of the more secondary reasons for site faults. Blockages occur more times than not from impurities that have got into the system from installation or repairs. You will find that the place where this occurs will likely be from internal mesh strainers within the system. Strainer/muffler - A mesh screen inside a liquid muffler. The muffler is designed to reduce refrigerant noise and/or pulsations at low/high velocity when inverters ramp up/down speed. So how do you know you have blockage? Easily enough you see low gas pressure don't you? , If your lucky that it is a liquid line based restriction point. No more times than not it is on a suction strainer after the suction isolation valve. Gas pressure builds up on your gauge side indicating you have lots of pressure but at the compressor is in a vacuum as the strainer/filter is blocked. These parts are not always easily detected in view. Look for the ball shape if they are a strainer/muffler and for circular indents around the pipe if they are a strainer only. Obtain a piping layout from the manufacturer to see where they are in your model. Temperature difference, pressure drop will spot the faulty ones. Remember , an expansion device is where we make it. Crushed pipes, blockages , so look for the ice ups. Domestic class AC remotes differ greatly from their commercial equivalents, Over the years , they have proved difficult to copy to a learning remote , especially in those home automation systems where you want one big remote to control all features. Well firstly , domestic wireless remotes might give you the false sense of belief , that if you press one button to change something , that's all you did.... not true. In fact they send all that is current in the remote screen when any button is pressed. If you ever want to check this, turn a remote to the on position away from an off indoor unit. Then go to the indoor and press any button other than on/off eg temp up/down , mode , fan etc. and it will start up because as part of the string of information sent to the indoor unit , "on" is set. The complex IR string of information is something that a learning remote will have a problem with. You may never have the same screen setting at any one time to say just turn the temperature up or down by 1.c. As a result they usually fail reading them. In saying this, there are now phone apps on smart-phones that can actually generate the right information. Commercial remotes on the other hand can just send that one change to the system and as such are more user friendly to many BMS systems. Option cards do not always solve this problem when incorporated to BMS systems. on domestic class systems, they can limit the total functionality of a remote control and frustrate the owners.Centralised control can be great and also annoying when trying to assimilate domestic class systems into them. A commercial system alternative is always a good option where possible. , they always work well on home or building automation. And if you have not noticed , a lot of domestic installations , use a lot more commercial systems technology these days. Seems that problem is getting easier to resolve. Networked closed loop AC systems may have pre engineered demand control in management devices or they may allow option cards to be fitted which will vastly increase their control ability over the network. (local indoor/outdoor address settings may need to be applied). The ability to load shed current off the AC supply by reducing the maximum power output of an AC system whether single or multi system. and by compressor control. . Inverters will have frequency restrictions, non inverters (and inverters) will cycle at times too. Imagine one simple switch being turned on in an network location from any point and forcing all units to go into ventilation mode shutting off outdoor units , or designated systems during times of non occupancy set to limited power. Many employ the use of load shedding when buildings are reaching peak demand , so this function is afforded to energy save and if set up correctly will not affect occupancy. The way this can work is endless, it can be from internal /external BMS control, single switch on timer, passive infra red detection in rooms, outdoor units in grouped sequence initiated from an indoor or an outdoor system. And this can be done on a massive scale in a network situation from a card no bigger than a mobile phone. You may not even need to buy those highly expensive network solution's to manage a simple energy saving need. Check with your AC supplier on the options and if your system has this available , you might get a pleasant surprise on what's possible for little investment. Your brand layout may be different to the images so please , this is just as a reference. Pressure transducers are very common when we see higher capacity air conditioning from usually 7kw and above in a commercial range , inclusive of variable refrigerant models. Take it from me, that they are the most annoying things when they fault and systems don't play ball during startup or even during normal operation. Faults may include , low gas charge warnings when its not lost gas. , failure of EEV 's to open up inside and pump down on startup, and reversing valves refusing to changeover from mode changes. 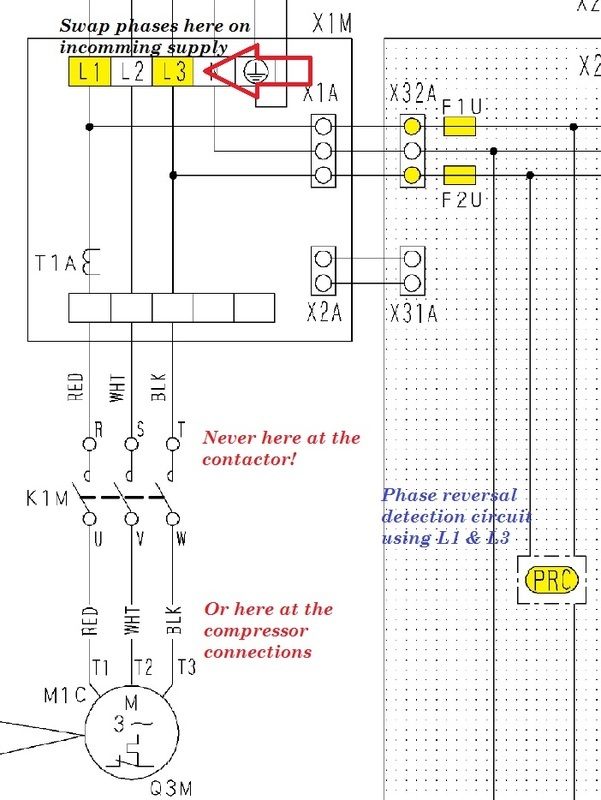 To that add performance/capacity problems or lack of speed in the compressor because the transducer failure makes the logic system think the unit is in a protective mode. The main PCB outputs (as below) a 5Vdc reference voltage to the transducer and it gives a pressure reference voltage back less than that. Well that was easy. (1 & 3 example below - your model please check the service manual). If it gives back anything else, either your pressure has been locked up by restriction or your transducer is stuffed!! Typically they might look the same but wont fit each others plugs , use the same voltages but reference from different terminal points and use different pressure/voltage charts So BE CAREFUL! The issue with these devices is when they read wrong but not out enough to generate a fault code. All sorts of unexplained weird operation will occur. So if you have a system with these in them and it does odd things , check them, they are very easy to check. If your lucky some come with schrader valve insets so they can be removed without recovery.... Check that with your supplier/manufacturer first though !! 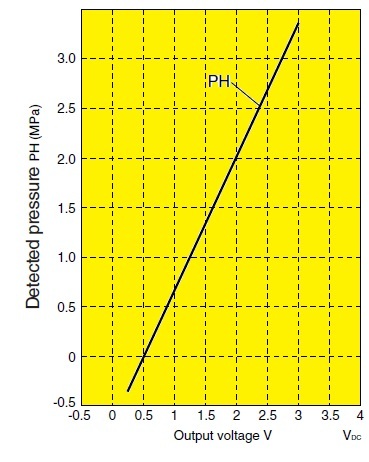 High pressure sensor as an example shown. How do you prove a unit is reasonably charged in winter on heating mode? Well a couple of obvious points , you could put the unit into cooling and check the total suction superheat. This should be nominal at 6k. Eg 6 degrees higher than the S.E.T or saturated evaporator temperature (read from gauge) measured at the vapour entering temperature to the compressor. Unfortunately, winter modes locks out cooling at 12.c ambient to prevent floodbacks (universal logic high end unit) and improves condensing in lower ambient's if they do operate. How most techs make mistakes with heating mode checks? Innocently.... A loss of charge increases the compression ratio and makes the discharge pipe much hotter than normal which makes most think the unit is gunning it as the suction line is really hot in reverse cycle.. In reality there is no energy at the coils indoor heat exchanger. (dam aussie winters are too hot at 6.c) and that heat of compression into an undersized condenser in heating mode smile emoticon You could weigh out the charge to be sure but this is an easier first step. So in heating the indoor really accelerates performance above 19.c air on to the coil. 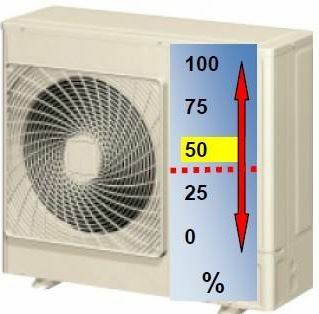 On average you will get a 25K(sometimes 30K) air split on heating mode. Eg 20.c air on indoor and 45.c leaving air temp. When they have no energy due to a gas loss and Im talking 50% they will be around 15K air split. This is worse when the outdoor temperature is lower (you find it easier). The customers don't see the problem as the air coming out of an undercharged split can be 35.c but the room just does not heat up quick enough. They will still complain. This air split will reduce as indoor temps rise as the thermal range of the indoor coil is capped at under 65.c pipe temp. 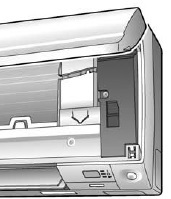 On ducted units that split is less due to the higher air flow rate so aim for 18-20K air split. Remember efficiency increases when air on coil increases. Now this is just advice from experience.... I welcome any updates. Seriously , are you a thread stripper?? . New installation and you give it a really good squeeze up til your arm hurts? Manufacturers of AC units give you the right torque information on the flares and even the outer valve caps. 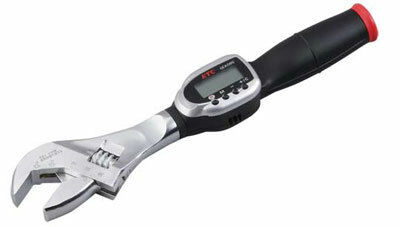 Digital adjustable torque spanners vibrate when attaining set force. They are very easy to use but almost never used... Maybe due to cost or perhaps apathy. Well why is it a good idea? Ok ... Think about this...... The flare has a small surface area that seals the face area at 90 degrees , and this is a good flare. Then it gets a permanent pressure force from tightening up. But that's not the end of it. .. It then receives additional force from the internal gas pressure and then another force from thermal expansive stresses. Add to that harmonic forces from flow , vapour or liquid. Always refer to the manufacturer and specific unit installation data. The table below is an example of what you might find. Manufacturers want you to use the correct installation methodology to extend the service life of an air-conditioner as much as possible. This process takes very little time to do right and we have access to more advanced tools than before , to make that job easier. We all use remote controls for many devices, air conditioning split systems is one example. Yet many service related problems come down to the ability for the remote to transmit the right sequence of information to the IR receptor on the indoor unit. So before you call the technician out , maybe you might want to remove the possibility that the remote is the issue. Well our eyes cant tell,, the scanning rate of the human eye cannot match the frequency of the infra red signature sent by the remote control eye. But your digital phone camera can. Simply hold it up to the remote eye, press and remote button and wait to see the light. And you see it... great but sorry that's no answer. All you know is the remote is sending out a signal. Unfortunately what it cant tell you is that passive infra red works on changes of heat, this heat signature cannot be reached when the batteries are flat. Whats more annoying is that the indoor unit may still beep when you press the button. The issue is that the signal may not create the required function effect you chose but it can also do things you did not ask for. ????? If you have a battery checker and the strip ones come with battery packs use it. Techs use a multimeter. Never mix old and new batteries EVER!!! , the bad ones will drain the good ones while in standby, sort of like a charger. Although a bad one at that. And please do not wait for the LCD screens to go dull before you change them out. they are likely flat before then. One other annoying reason why remotes do not work. High efficiency fluorescent lighting , even compact fluro lights can emit a frequency that splatters the remotes heat signature. If this problem happens at night try use the remote with nearest fluro light off. Lastly the SUN>>>>> yes our solar mate if in direct light contact with your IR receptor panel will be the ultimate signal blocker to a remote unit. Close the curtains. 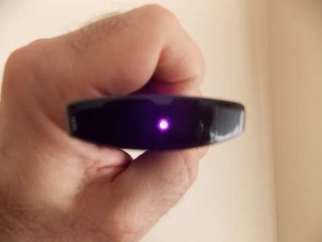 The scanning rate of the human eye cannot detect the scanning frequency of the infra red remote controller. A digital camera can and can convert the image to be seen by our eyes. Typically a loss of 0.2 volts dc from a 1.5Vdc battery is enough to make it depleted. We have seen since the introduction of R410a that back to back wall splits air conditioning now has minimum distance limitations. Discharge pressures and condensing temperatures are now higher due to the new class of refrigerants. In some AC units there is a minimum indoor to outdoor piping distance of anywhere between 1.5 to 2m depending on unit class size. Many believe this is due to an overcharge of refrigerant based on the lesser pipe used for the pre-charge supplied. Not so. It is quite the issue on heat pump or reverse cycle mode not cooling mode, effectively you have no discharge pipe area and no room for expansion from the compressor valves. There needs to be a sufficient break volume area after compression or the unit will risk an overload of pressure. This problem is made worse with higher capacity systems. So if you do not have the clearance needed due to the installation distances , then you will have to coil up the residual pipe somewhere. It might seem tacky but you are doing both yourself and the customer a good service. Why Air Conditioners have just got better over the decades. In today's ever energy conscience world , all is not as it appears. Many still opt for the fixed speed compressor but do not realise they bought an inverter based technology appliance. Many techs may have worked on some new constant speed compressors and thought they were working on inverters. Well the tech and layout is identical, with some differences. Effectively the frequency is locked in a typical limited floating range to mimic the output of a constant speed. Yet we have to fault find them just like an inverter full frequency ranging unit. And with that comes a new excellence in protections. The bonus , is that most of the afforded protection modes to normal inverter models also apply to the so called constant speed. 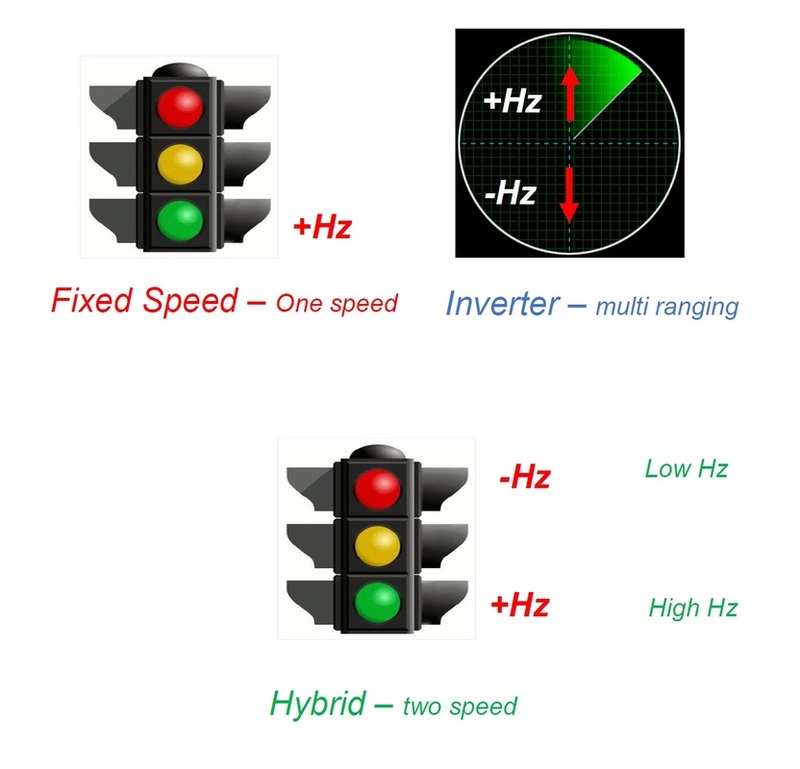 Hybrid models by comparison will actually have more frequency ranges they work with but not he full range a typical standard inverter model that offers up to 30% power savings. All though, with this tech will do all they can to, prevent compressor failure. Gone are the days where we run a compressor to death in hot weather or low charge , unless you have one of those older type constant speeds with basic protections devices. For those that do not know, all modern inverter based technology protect the system first and give the customer what is left in capacity. A far better trade off than damaging the compressor for a basic HP switch or a thermal sensor on the dome. All of those things are last line of protection. The manufacturers have logic controlling thermal, current and believe it or not , the mollier or pressure enthalpy of the systems refrigerant , factored in fault detection's such as low charge or superheat variances. Fan blades are not blades, no they are aero asymmetrical in design. These sharp pointy types are not just for effect visually , that is, they are not there to aesthetically please us to look at. No they have a major job to do. They must displace maximum quantity of air , reduce noise and weight back onto the driving motor. Their design must also incorporate enough pitch to deal with statical pressure to move the air through the fins. Since most outdoor fan motors are DC now, generating the right load vs power input is essential in design. We know DC motors suffer no slip losses like their AC brothers , and we know they also produce less motor heat. Matched with the right fan blade , we can reduce overall power input without compromising efficiency. Schrader valves might be highly convenient, but they are also highly annoying. The purpose for these allows for charging and service access , but when it comes to evacuation , simply unworkable. Now many will disagree... and I hope its not those that rely on the bourdon tube in the compound gauge to judge a good vacuum. I have also read "to my surprise" in split installation manual that a system with 15 metres of pipe should be evacuated for a minimum of 15 minutes!. I thought AC manufacturers would suggest better. Now understandably, service access on many units only provides for 1/4 (6MM) line access. Yes you can achieve the correct vacuum with such access as long as a micron gauge tells you that. Of all considerations to installation, keeping a system clean , dry & tight is of utmost importance. Many do this but the consideration of a good vacuum should be also of the highest priority. 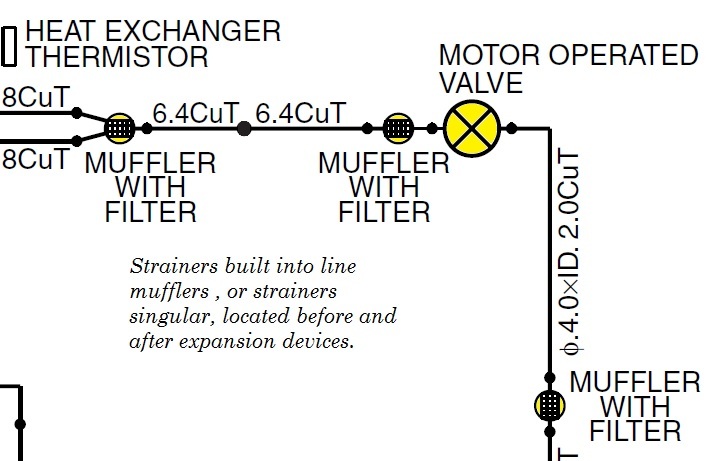 The best approach to vacuum , is to use the largest diameter pipe from the vac pump and connection to any system,Typically most pumps allow for 3/8 (10mm) connections. Evacuation/charge manifolds are now available with a 10mm primary vacuum connection flexible hose to the pump which is far better than simply attaching a 1/4" (6mm) hose. Of course it is also known that using hard copper (10mm) for a main vacuum line is also better than using a flexible line which may have adaptors or core depressors within them restricting extraction surface area. Larger to smaller is better than smaller to larger. Schrader valves have a fabulous blockage in them , known as the core!! , see below - The actual surface area is merely a micro area that allows flow. Under pressure ok, Under vacuum , not so good. Using core extraction tools is great idea, many do not even know of their existence. 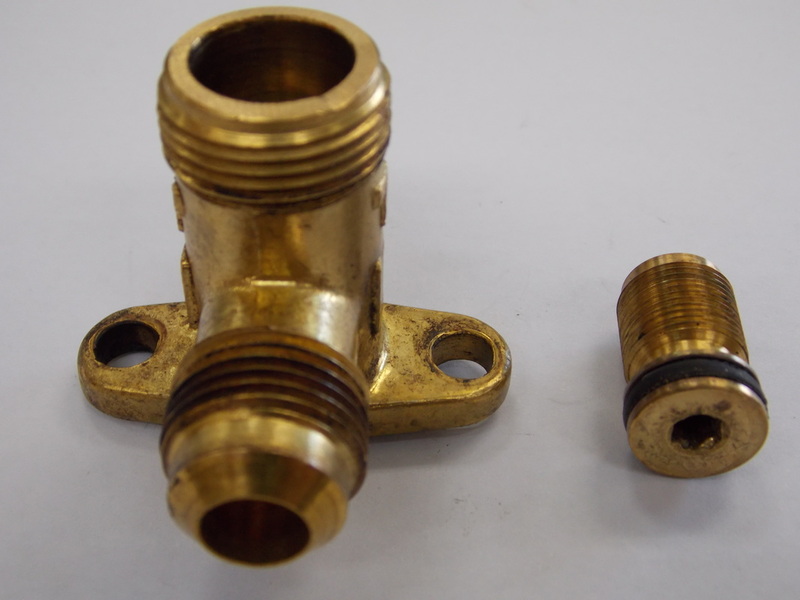 Caution though as some AC brands do not allow easy extraction of cores due to locking mechanisms within the brass. , and in that case a small volume to evacuate in installation piping may not require that much consideration or need to remove it. Does anyone evacuate to part II AS/NZ Refrigeration code of practice standards for systems that are not self contained, achieving a vacuum below 500 microns , not exceeding 600 microns in one hour? Do we just give it the 15 minutes it needs?? Does anyone use a micron gauge or other vacuum gauge? Does anyone use the triple evacuation method or select a pump with a capacity appropriate for the system capacity? Insufficient or poor vacuums are the reason and the catalyst of doom for any newly installed unit. Hermetic compressors for instance are built so well these days , that failure of the motor can always be attributed to causality. Longevity of operation has many considerations, evacuation is one of the biggest factors to the ongoing trouble free service life of a system. The swing compressor gets its name from the action of the orbitor and the key giving it a pendulam effect. 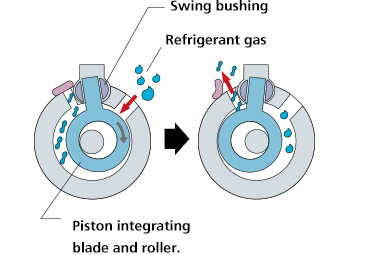 As the key moves it also allows greater area for suction gas to enter the compressor compared to a rotary design. The anglular shift increases avaliable suction volume although it may not appear to be doing a great deal more. As a result swing compressors now feature in compressors for 7kW cooling design due to their more efficient operation. Note how similar the two are but how they have overcome leakages with the seals from the bush sweeping the obitor. All eccentric action compressors are balanced by crankshaft weights to reduce harmonic effects on the motor drive. While a rotary and swing action seem almost identical the enginnering design between them sets them apart in both effiicency and capacity. Why are some air conditioning compressors discharge gas cooled? See all the hype on how efficient someone can make an air conditioning unit is also based on the fact that they are already the most advantaged system compared to medium and low temperature systems. And this lower compression ration means that the discharge port temperature is so much lower that it actually can cool the compressor windings down in hermetic systems. Unfortunatley medium and low temperature systems with their higher compression ratio's cant oblige that and require suction gas cooling into the dome. In the AC design , they discharge gas into the dome and this is so much better. For a start , you dont superheat the gas further before entering for compression and this removes unwanted extra heat of compression and volumetric efficiency issues. This also means the dome gets hotter. Now please do not take of those acoustic blankets on the compressor thinking you will keep them cooler. They are for sound attenuation , if a compressor overheats , it is becuase it is running short of gas. The suction pipe enters the compression chamber directly without passing gas over the windings, and the discharge gas is passed over the windings as it it atmospheric discharge not atmospheric suction. It works so much better and increases capacity, a real shame we cant do that with meduim and low temperature systems. AC units are so more advantaged , but hey, since sales of split units doubled from 2004 , getting more energy effiiciency is the key to sustainable use. Why not ?? Whats that hissing/cracking noise ? 1 - Retirement villages self contained homes with only one main AC power supply that can service one outdoor unit power load (20amp) with fractional power loads indoor with Fan coil units. All rooms can be used with diversity and no additional outdoor supplies added especially when they restrict you to do so in the terms of ownership and how many AC's you can install. 2 - They save space , yes thats the best part when the outdoor walls or area cant allow more units. 1 - Machines can be over-connected from their cooling capacity eg an 8kW unit connected with 14.5 kW indoor units but if more than one unit is run they lower the original indoor capacity. If designed correctly with a day/night arrangement this is not so much a problem where diversity of use is factored. Note: heating capacity on indoor units is not as much affected due to the greater COP , good o'l heat of compression and many retiree's love a good warm house. But on heating mode , you may find the AC boogie man appearing at night when its quiet. And I'm here to tell you all its normal. Well good news is they are quite right!! The outdoor unit must consume a minimum index of capacity on heating mode as it is far more powerful. We have a large evaporator called on the outdoor unit on heating mode and far smaller condensers on the indoors. Now if one indoor is used and others are not on heating , the tricky computer lets some superheated gas into the non-operating indoor units to control possible overload on pressure. (high pressure control) It does this by opening the EEV to the non operating units from the outdoor system. So the indoor units that are not operating will heat up, expand the metal and plastic framework, cracking noises and expansion noises will sound and eventual gurgling may be heard with subcooling but not too extreme. Of course at night its quiet in the room and the customers hear things. Folks , I consider that trade-off for multi connection a small issue and very clever of the units to do this to reduce HP, but perhaps explain it to the customers next time they call you to ask about it. Its quite normal and once they know why, then they usually relax. This issue comes up more frequently around this time of year during the change of seasons from winter to spring. You may or may not be aware that the majority of domestic and commercial manufacturer brand of air conditioner have heating mode disable when the outdoor ambient is too high. It varies all the time what the disable mode temperature is, sometimes 27.c and other times 24. Most seem to be 24.c but always refer to your service manual for this information on the specific model if applicable. The premise is simple, we cannot sustain operation without overload on high pressure when the unit has very high outdoor ambient temperatures, Rather than cause damage, the unit is not permitted to start. And when it does this , typically it wont tell you its locked out. The unit will show heating , no fault and be usually in low fan preheat or hot start mode. The disable is actioned by the ambient air thermistor on the intake of the condenser. Now this drives customers mad and I have been at the brunt of it myself. During the change of season a one off hot day can prevent heating mode , yet the building is still cold enough inside that it needs to heat. Now this is something you cannot fix, its normal and intrinsic to computer logic control. Above are some images as to what happens , The most common is a morning sun radiant contact directly onto the air thermistor, the chance of that happening is rare and is based on unit position and angle to the east. Other reasons are radiant heat reflection off walls that are very reflective or can can store energy very well. This is also a sun effect of radiant heat reflection and can occur in some instances as a solarium effect from shiny mono-deck roofing. The fix, easy get your newspaper and wave air across the air thermistor outside. Once it cools to below the lockout temperature it will start the unit up. Then the lower air temp will pass over the air thermistor and it will react normally. To prevent this, try to shield the air thermistor from direct solar contact or make sure there is good ventilation from a wall. Its a rare thing for this to happen but it does happen. Once the customers know and if the unit is safely in reach they can try this themselves too. They just need to wave air across the back of the unit sensor. Please note this picture is a little graphic. Rodents can be a serious cause of component failure on split system air conditioning. Many think that since the AC has no food value a rodent might just ignore it. And while this is true , rodents like to explore their environment. The picture below is a rodent who has expired from current flow , the whole reason this poor chap met this unfortunate end was that the penetrations into the unit were not sealed to the indoor split unit. Simple silicone or putty could have prevented this, many installers do not always seal the cavity's to walls. Apart from this problem you can also induce warm air in too. This mouse decided to set up a nest here and brought in leaves from the outside as bedding to his new home. You cannot see the leaves , they were removed. The result of this is as follows. The mouse shorted out the DC rectification circuit as this was a DC permanent magnet fan motor system. This also destroyed the fan motor converter IC and blew AC varistors. 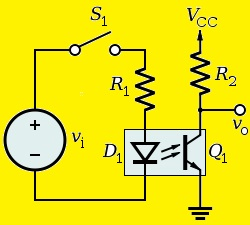 The varistors are designed to arrest high incoming voltage by shorting active to neutral. So we are left with a dead fan, indoor pcb and a dead mouse. Of course manufacturers are likely not to see this as warranty which leaves a less than impressive outcome for the end user. Moral of the story --- Seal the Penetrations at all times. Ever had those complaints from customers that they hear no difference from high speed to low speed on ducted units? Well chances are they are right but , its not really always due to a poor installation, in fact its usually a good install. OK without all the maths to confuse everyone, ducted fan motors are designed to provide a base level of airflow in L/sec with nominal statical duct pressure. Depending on the size of the indoor unit that can be from 100 to 150 pascals. The chart above is for models with 100 pascal statical pressure. They typically have a setting to increase the airflow by changing the indoor units default high fan speed from a factory setting to a larger speed to overcome it. This overcomes additional static pressure from longer duct runs. Now be aware that you should always install ducting with the base external statical pressure in mind. This is referenced from the engineering data of the model. 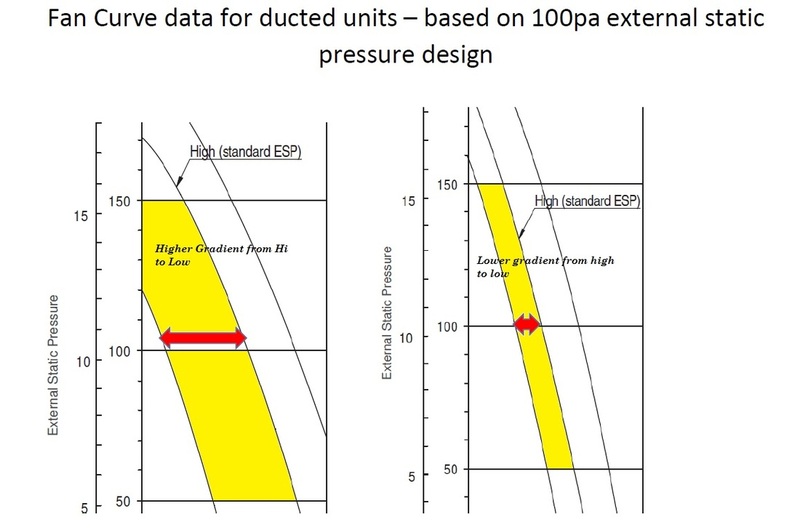 In some mid range classes the difference at standard ESP from high to low is not that noticeable, so if your a good installer and limit the ducting you will likely decrease the static pressure and provide extra velocity. Hence we hear not much of change from high to low. The fan curve data shown is showing a 7kw vs a 10 Kw model. Only difference is evaporator and motor size. You can clearly see that the larger model has a much lower gradient of change from 100 pascals. Now I'm not blaming any installer here for being clever but if you do get the question, you may need to increase the duct gains to deal with lesser statical load. E.g put more on. ​So inverters adjust capacity for oversizing ?? So many times I hear that someone said to customer, "hey the unit can be oversized as it will adjust frequency to your required capacity , if you have a hotter day then you will get the extra capacity you need"
Always select an inverter the same way you would select a non inveter system. They are not happy at all being oversized. Ok... so you will see in both cooling and heating modes, an effective capacity control range that they work with. The natural assumption is that it will work ok in all of these ranges. Well in fact , the unit was design tested at specific conditions of indoor and outdoor ambient at db/wb conditions to achieve a performance rating given to the nominal capacity. Now this varies but to give you an idea it is around 27 indoor and 36. outdoor db , with the indoor based on 55 to 60 % rh factored for wet bulb operation. They can also be compliance tested above that to ambient of 43.c and this is really seeing what they produce in both sound and power input/output at maximum thresholds. You really should be aware that most days we have an average condition of temperature. And... thats what they are rated on with the energy savings !! If we lived in a world of continuous extremes the manufacturer's would have to re-think their designs. And so the outcome of oversizing an inverter is that it will compensate for unneeded capacity that could cause low coil temperatures but it will be working in a performance area not rated for the actual proper delivered energy savings. All units will consume a minimum input power index to their size regardless of capacity. And so those star rating may not be working for you as you expected. In fact you will consume more power for less work with an oversized unit servicing a smaller area. Other factors that could apply are increased noise due to the unit working at higher octave sound pressure at lower octave frequency... You know how we hear the doof-doof music in houses all the way up the street, well AC units in lower octave frequency can produce more audible noise that can carry to the more distinguishable filtered spectrum of human hearing. So they are groaning in low capacity so to speak trying to compensate for low load. 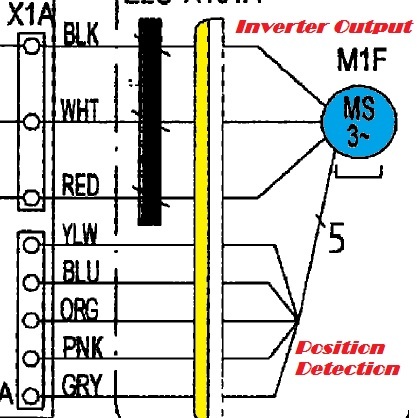 In short inverters offer savings at part load conditions but not.. no load conditions. So how does a manufacturer of an air conditioner achieve such a feat of brilliance? 1- Make compression ratio as low as possible, keep suction pressures high and discharge pressures low. 2 - Adjust refrigerant flow with the system mollier conditions in mind, a sort of pressure enthalpy equation in ongoing process. 4 - Logical processors that make decisions in real time to improve performance based on temperatures across the system. 6 - Inverter compressors that have neodymium rare earth magnets. Active circuit power factor correction that prevents poor power factor from switched mode power supplies. Lower source generated inverter voltages adjusted for higher output frequencies. (you cant have high voltage and high frequency, it causes terrible power factor problems). 7 Aero Asymmetrical fan blades to reduce noise and displace more air for weight. 8 - DC motors rather than AC field motors to reduce heat and improve performance electrically. 9 - Increased evaporator capability by curving the coil around the unit increasing the overall "U" factor for heat absorbtion. 10 - Well this ones a good one, See no matter how one swings the bat, In Australia , the best input power vs output refrigeration power is based always on heating mode. (C.O.P co-efficient of performance) Does not matter how one says it, you get the heat of compression into the indoor unit on heating mode as a bonus increasing the effective output refrigeration power. So 7 star may not be cooling mode?? But no one ever complained about poor heating did they? Cooling mode , check E.E.R or energy efficiency ratio and the higher that is, BUY IT!!!!!!!! What would you think if people made the same air conditioners with the same parts but configured the logic to mimic specific actions? Eg you have an inverter system without the inverter logical control. Well there are two other types of systems that came onto the market which did just that. They all used the same parts but in essence they were configured to mimic existing compressor actions. Hybrid. 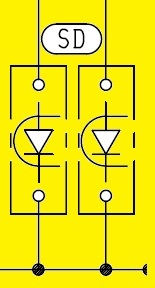 Has the potential for two operating ranges where the frequency sort of has a high and low range and it floats on one or the other. Inverter - The compressor will operate across a given range of frequencies offering greatest energy savings as we all know by now. So why??? Well its a good question, some think it was to prevent panic in the market when inverters came out , the most common reason is price. Eg they are cheaper for the fixed speed models.But realistically most manufacturers could not use AC motors and try to achieve the same energy savings with MEPS (minimum energy performance standards) . So they made simular acting units with more efficient motors. yet they have the same parts in them, minus the programming?? **They have potential to save energy using permanent magnet compressors rather than AC motors with slip issues. *** They use all the same protection features as the more expensive models. ** They integrate into BMS controls easy as since they have the same pattern communications. The only downside... which is not much is that you have to test them and diagnose as you would any inverter model with all the typical pcbs. Hey I have two bottle openers at home.. one is more expensive yet they are identical in design exactly and work the same. Does it make my beer taste any better? Then action diagnostics for malfunctions checks if no led blinks. Why is my ducted AC noisy ? Too small a return air grill for the volume of air will cause draft noises and suction effects. That one most people get. The most common comes down to the quality if the ducting used and its ability to attenuate sound. Even with the best quality ducting , it is essential that distance from supply and return air be maintained by manufacturer specifications to reduce noise. Our most common issue is when the return air is very close to the indoor unit. In this case there is not much sound abatement. This situation is more common in smaller ducted systems from 7kW and below where they are fairly close to the indoor unit. This is mostly due to a small house/apartment and available space. In larger systems highly uncommon as we see typically longer runs and centralised installations to the roofspace. In general the premise of noise concerns for all air conditioning systems seems to be more with the outdoor unit. Complaints on noise for indoor are more in general with smaller systems and very large indoor units. Insulation batts provide excellent sound dampening media, return air grills are a window to sound. In some cases by running additional flexi duct to the return air box by increasing length will result in a fix. We don't look at these specification of noise much, but they are there and they have been tested. What's new in the zoo? It's been a while since I have looked at some Daikin units. The latest ducted models using a now larger indoor unit with inverter fan have finally provided the much needed improvement to the full electrical picture. Inverter motor tech is now widespread, not many would own a washing machine now without a brushless DC inverter motor, and this deals with large weight and load very effectively. The advantages of using this technology is immediate and real savings in energy consumption combined with lesser motor heat output and associated losses. If combined with the plastic scroll , even lesser weight back on the motor and even more savings. Given that the indoor fan is a full time component , It makes so much sense to conserve energy with it. However , it is possible to track and map indoor motor efficiency and provide some latitude with speed regulation. It can also allow for variations in speed to improve dynamic airflows where additional static pressures from ductwork can be now more easily overcome ,without wastage of power by fixed AC rpm methodology, from alternate winding speed references. In some models they use automatic setting of maximum static pressures and set maximum fan speeds as not to waste any more energy. Testing of these units is easy to do , and is no more difficult than outdoor unit testing of the same design if we were to equate it it a VRV for instance with condenser fans. Of course access to the indoor and room to move will never be resolved here as we all know in some installations. In order to do this , I expect more sensory data has been enabled into the predictive algorithms. At least that's how I see it. Yet this can provide more specific testing and point to causality in real time that can indicate non system faults. One fault was related to power surge fault caused by "thunder" and that even though we may jest , they are being quite serious. For an manufacturer to know that, we should take notice. Perth WA, (where I live) was in for successive days over 39.c , so will the split installation and/or type of split survive it ? Firstly , most new outdoors have been rated at 43.c ambient to provide some continuous operation , this though may not be at full capacity. Units generally are design rated to 36.c outdoor and 27.c indoor maximum dry bulb conditions to achieve rated capacity. Modern control designs now also look at indoor conditions and if they exceed 27.c return air for too long , they will cut back the operational capacity Now more than ever, reducing indoor heat leakages, direct sunlight and window coverings more critical. The issue has much to do with the outdoor discharge pipe thermistor. 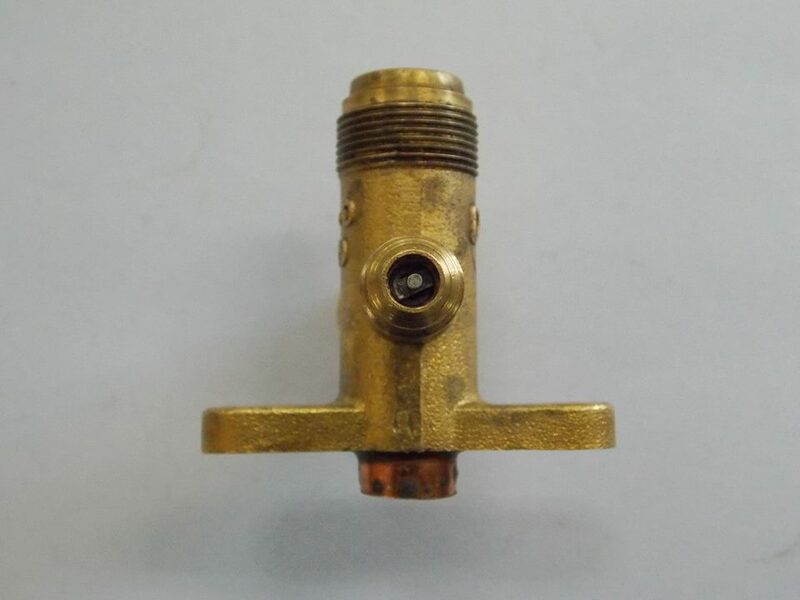 Out of all protective modes that one can drop frequency or halt operation very fast, the discharge pipe sensor will override all else other than direct protective safety's such as a high pressure switch. Discharge pipe protection will progressively slow a system down , and this is all to protect the compressor, Next to that the current transformer will reduce operational speeds if maximum unit amperage is being met too early. The unit will do everything it can to ensure a decent compression ratio to prevent high discharge temp and high amps. Customers will always tell you that it works poorly during the day and gets better later and thats because the system has released its protective modes when everything has cooled indoor and outdoor. So here are some things to consider when looking to try and reduce or deduce the instance of protective modes. 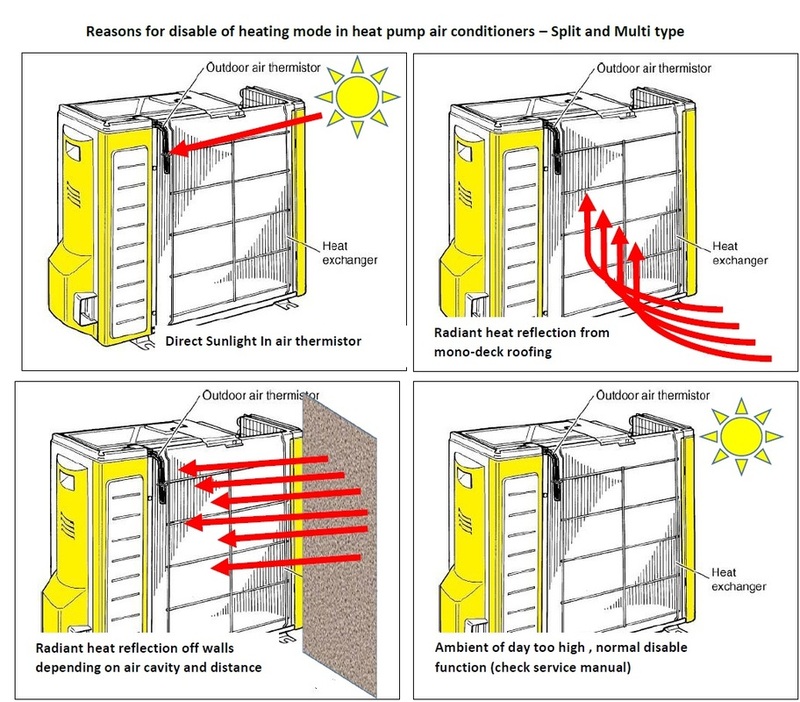 1 - Location of outdoor and indoor to prevent direct sunlight , look for outdoor air re-circulation or air discharge impingement to plants/fences/shadecloth, watch out for direct sunlight on outdoor unit air sensor or off very heat reflective wall materials. 2 - Correct charge including additional charge required for longer distances than specification. 4 - Get people to run their units in the cool of the morning before the high weather comes in. If the indoor and house has lower load , the outdoor can transpose better capacity outcomes with less chance of protective modes during the high heat. Indoor furnishings and walls when at lower temp also act as thermal bricks and become secondary heat exchangers assisting house control. 5 - If people leave their homes , rather than turn off the AC , increase the temperature by 2.c higher, this will both save money and assist in easier recovery to temperature when they return home. It is also know as temperature shifting. Lastly... In very high ambient sustained weather , it is likely that most units will generate protective modes eventually. Units which do not have any logical controllers will run until they fault or overheat. If units exceed their continuous operational temperatures they will fault and if a unit does enter a protective mode in the heat , it will likely not be able to recover until conditions have improved again. But you will have something rather than nothing without compressor failure. 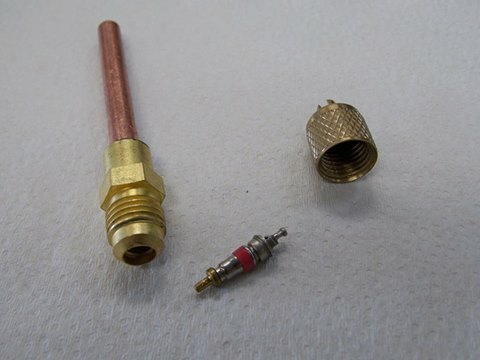 ​Split air conditioner service valves.. Unlike refrigeration condensing unit King Valves, these were never meant to be used all the time. Typically , a split air conditioner comes pre-charged with refrigerant and the valves are opened once installation , pressure testing and evacuation have been completed. The valves have only an O-ring keeping gas leaking from the valve and they seal by a tapered angular fit at the base,See pics!! You might get a service call to either pump a system back to service a part or to relocate a condensing unit. Its at this point , you should check that the valve holds tight. To do this I recommend the following..
** Run the unit on cooling mode to get the oil moving around to help coat the valve seats for a few minutes. *** Close off the liquid line and pump back to atmospheric pressure. (0 kpa gauge). 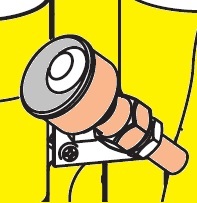 Close of suction valve. *** Wait for a few minutes to see if the compound (suction) gauge pressure rises. If it does it might be that some refrigerant is bursting out of residual oil in the lines , or it could mean the valves are not holding. *** if it does rise , repeat the process and see if it improves, if not , you may have leaking valves and this might require replacement or full recovery. The last thing you need is to try to pressure test the unit again and have nitrogen breach the valve contaminating the refrigerant in the outdoor unit. It also would be impossible to evacuate it as the refrigerant will be extracted through a poor sealing valve. This does not occur with new out of the box units. It is more for established units where service work or relocation is required after a period of time. Mostly you wont have a problem, but hey why risk it.. Manufactures have replacement valve assembly's for their units and there are generic valve sizes at some spare parts wholesalers.